Is Trump—Russia a Distraction for the Left? This is an issue which has divided the left ever since it became clear that the Trump-Russia narrative was not going away. We are largely split into three camps on this topic. — Policy tangibly affects people’s lives, so it is the only thing that we should focus on. — We should “stay focused” on Russia in order to remove Trump from office. — Those of us who want both policy and Trump-Russia to command similar attention. I tend to fall into the third camp, and most of Paste’s politics writers likely fall in to the first. To adequately answer this question, we must ask: what is it a distraction from? Is it a Distraction from Policy? The Michael Flynn indictment superseding coverage of the Republican tax bill on Friday is shameful. I have been writing about Russian influence in the Trump camp since last summer, am utterly convinced that nefarious Kremlin activities took place at the behest of President Trump, and I still think that Flynn’s indictment should take a backseat to this monstrous tax plan. Even if our worst fears about Trump-Russia are realized, it will have a fraction of an impact on our society that this bill will. I get that taxes can be boring, and many Americans’ eyes glaze over the second we start putting percentages in different brackets, but this is yours and your children’s and their children’s future. What happens to some dope who ran himself out of the DIA is not. You can affect policy. You do not have any influence over perhaps the most top secret special investigation in American history. The Trump White House knew about Flynn’s indictment at almost the exact same time the rest of us did, so to those constantly preaching that we need to “stay focused” on Trump-Russia, what are we focusing on? How is our energy going to alter the investigation? These are questions which are impossible to answer, yet when you apply them to the GOP tax plan, it’s very clear: call your representatives. That’s why they’re called representatives—they answer to you. Robert Mueller does not. Is it a Distraction to Enacting Liberal Policies? No. If anything, it helps. We can sit here and lament how sad it is that there seems to be more energy surrounding Trump—Russia than opposing the draconian Republican agenda determined to liquidate our future so the super-rich can buy a 46th yacht, but that energy is valuable. That energy is what motivates people to go to the polls—and as 2008 demonstrated, when Democrats turn out a big swath of the electorate, they’re practically unbeatable on a national level. Yes, we should be primarily focused on Congress so that we can try to influence legislation, but the Republicans control both chambers. They’re not accountable to liberals and they have no desire to be. Theoretically, our energy can make a difference to help craft laws in the House and Senate, but we’re dealing with a party that wholeheartedly believes a Republican child molester is better than any Democrat. “Moderate” Republicans like Susan Collins or Lisa Murkowski were hailed as saviors when they struck down the last iteration of the GOP health bill, yet they let CHIP expire—putting millions of children’s lives in danger, all because of amorphous budgetary reasons that don’t apply to the wealthy. Congressional Republicans don’t care about you unless you have at least seven digits in your bank account. They’re determined to pass a wildly unpopular bill that most people agree is a giveaway to America’s oligarchs, so let’s be real: there’s only so much we liberals can realistically do to affect policy being made right now. You cannot apply logic to the Republican Party because they do not operate within reality (I mean this as fact, not hyperbole). If we are to truly reverse all the damage being done right now, our only chance is electing a Democratic Congress in 2018 and 2020. Opposing the GOP tax plan at best, kicks this can down the road, guaranteeing that we will fight against it again and again and again. 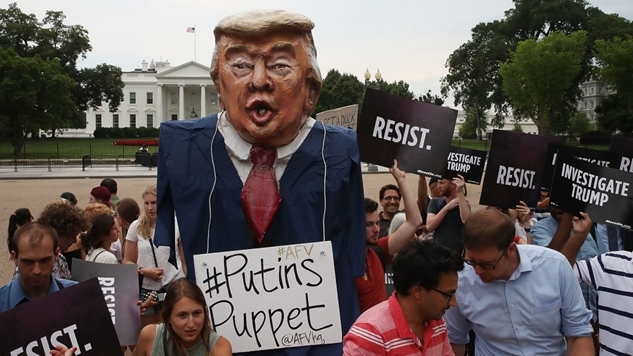 Discouraging the energy created by Trump-Russia hurts our long-term prospects to fix the policy missteps currently taking place in Washington D.C., because the only way we can truly rectify them is to vote these aristocratic septuagenarians out of office, and we need all the help that we can get. Not to get all philosophical on you, but that word really is in the eye of the beholder. We all have our own policy agendas, and part of being a big tent party is struggling with the disagreements which are bound to arise. There is no doubt that from a media perspective, Trump—Russia is a massive distraction to the litany of much more impactful offenses perpetrated by the Trump administration every day. However, as the Democratic landslide from last month demonstrates, the media does not mirror the electorate. It was one of the greatest election nights for liberals in recent memory, which suggests that the degree of the Trump-Russia distraction may be overstated. I have access to Paste’s traffic numbers, and our Trump-Russia pieces all have a very high floor. If you look at journalism from a capitalist perspective (which we shouldn’t, but that’s a column for another day), it makes the most economic sense to continue writing about this topic. It’s simply us suppliers rising to meet the demand on this issue. Which means that we’re stuck in something of a negative feedback loop. We write about Trump—Russia because people are interested in it, which then generates more interest in the subject. We experience massive news days like Friday, and when outlets decide to stress coverage of one facet of a special investigation over a complete and total overhaul of our tax code jammed through the Senate in the dead of night by a party hyper-focused on helping the wealthiest among us, the distraction trope is more than understandable. The tax plan is something that affects us now. The Flynn indictment is just the beginning of his cooperation with the Feds. There just isn’t much to report on Flynn other than informed speculation, and the GOP published their tax bill. From a journalistic perspective, it’s not even a debate which one should command the news’ primary focus, but because we operate off a capitalistic model and not a journalistic one, Trump—Russia takes the lead over almost any other story. Until we come up with a different model to fund journalism, this dynamic will continue into infinity. The American experiment is undergoing a severe stress test right now. Republicans see the writing on the wall—that this iteration of the party will not survive once millennials comprise a plurality of the electorate (we’re the largest generation in history, we just need to show up to vote, and we can run this country)—so they’re clearly trying to redefine what America means before our generation either kills the GOP or redefines it. There is an electoral bloodbath coming in 2018 and maybe 2020, and what the Republican Party is doing right now is the literal definition of undemocratic. Trump is also providing a stress test—both by his historic unfitness for office, as well as whatever the hell happened between him and Russia (I wrote a deep dive on this back in March—you can read my theory on what happened here. I still believe the vast majority of what I wrote, but my biggest miss was not including Jared Kushner in any of it). It’s difficult to take a long view of American history when it seems like we’re losing it altogether in the present, but this Trump—Russia stuff will be incredibly important as more time passes. Look at how Watergate completely changed America’s relationship with our government. Less than half a century ago, we almost universally believed that the United States had its citizens best interests at heart, and now that’s a laughable assertion. This Trump-Russia scandal will have a similar impact on our relationship with our government and/or political parties. It’s far too early to tell what that will be since we still don’t know what happened—but given that Trump’s National Security Advisor, his Campaign Manager, his Campaign Manager’s chief deputy and a foreign policy advisor have all been indicted by a special counsel investigating this mess, it’s safe to say that some coordination between the highest levels of the Trump campaign and Kremlin-connected outlets took place. The degree of that coordination is still highly in doubt, but we are deep enough into the woods that classifying this investigation as frivolous and unimportant to the larger goal of returning America to a progressive society is missing the forest for the trees (well, it’s never been a progressive society for anyone who isn’t a white male, but you get the point: Democrats need to win elections. That’s how we affect policy). There is a direct line between a Republican presidential campaign coordinating with nefarious foreign entities, and the Republican Party becoming a wholly-owned subsidiary of the richest people in the world. If the GOP is willing to sell us all out to the Lords of Wall Street and Walmart, how are Russian oligarchs really that different? The 21st century has proven that the global super-rich have far more in common with each other than their fellow citizens. This entire Trump-Russia narrative would not be framed as that big of a deal if you substituted big business for all these foreign cutouts, and our outrage should be a lesson of the larger issue at hand. American democracy takes a back seat to American capitalism, and American capitalism is not confined to our borders. If we learn from this ordeal, Trump-Russia is not a distraction, but an unimpeachable example of how far this country has gone to sell out its citizens to the highest bidder—no matter who that bidder is.